The NYC Department of Education's STEM initiative's ultimate goal is "to produce a highly competent, STEM based professional workforce, which is currently lacking, not only in New York, but in the Country as a whole." The department seeks to transform the way Science, Technology, Engineering, Art and Math education are delivered in the 5 boroughs by providing all the science teachers access to the latest STEM teaching tools along with a program to support them. Working with teachers for over 15 years, both RobotLAB, the leading educational robotics company, and A+ STEM-Labs, the creator of interactive mobile STEM labs, realized that using technology in the classroom is not an easy task. And it can be overwhelming at times for teachers, especially in the typical, 30+ kids' classroom. 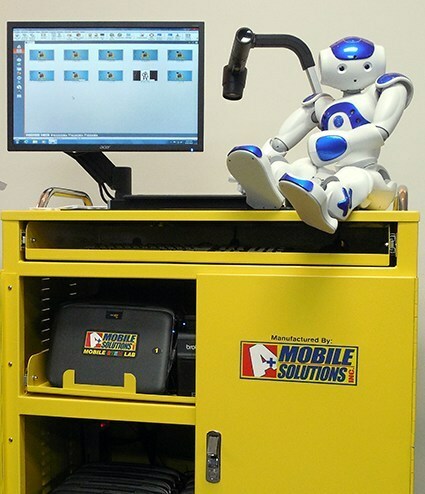 As a result, the two companies partnered together to bring innovative and engaging mobile STEM labs to the classroom with robots like the humanoid robot NAO. The mobile, hands-on STEM lab is loaded with laptops, classroom-management tools, software, access to the online-learning-platform Engage! K12, and of course the NAO robot. This makes STEM/STEAM achievable for teachers and helps them to better manage classroom time and student engagement. Each Lab comes with professional-development tailored to the teacher needs. RobotLAB's award-winning, standards-aligned K-12 programs, which use robots to engage students, are deployed in more than 2,500 schools across the country. The partnership with A+ STEM-Labs takes the programs to the next level - transforming every class into a STEM class. It provides a turn-key solution that requires little-to-no-setup or integration with other classroom components. It brings in hands-on experience that truly revolutionizes students' learning and secures their career and college readiness. "We are dedicated to giving educators the tools necessary to efficiently use technology in the classroom while providing solutions that prepare students for the advanced careers of tomorrow," said Bill Waibel, President of A+ STEM Labs. "Partnering with RobotLAB and their Engage! K12 platform by pairing their products with our Mobile STEM Lab creates one of the best turn-key coding solutions out there." The NAO Robot and mobile STEM labs can be found in hundreds of schools throughout the NYC school system. Additionally, hundreds of schools nation-wide are expected to get on board and deploy the lab as a part of their standards teaching practices during the 2018-2019 school year.